Yes indeed people, I got into the big, bad ocean yesterday. The day before I went to Costco with a friend to help her buy a surfboard. Yes, Costco sells Wave Storm surfboards. They are foam boards that are perfect to learn on, and perfect beater boards for the seasoned professional. Inexpensive, light weight with attractive retro stripes, they scream “Beach Boy’s” fun, sun and the easy days of summer. Okay, so I am easily overwhelmed with the aesthetic pleasure a surfboard can give. I even like the really old ones that have yellowed from the sun, cracked fiberglass, with darkened dings. 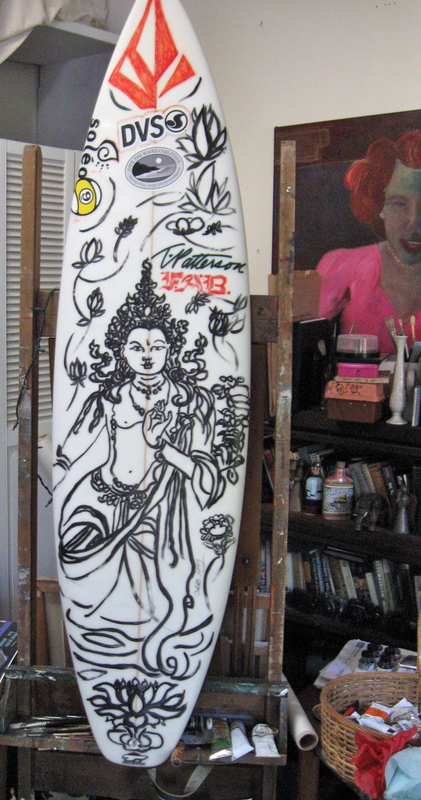 Like records and books, old surfboards tell a story without having to be touched. As my friend checked out the boards she ever so slightly suggested I get one too. My brother had lent me one of his “learner” boards but I knew he would want it back at some point so I threw out any sense I had, and grabbed one for myself. The two of us were a sight strolling through that cavernous store; a Laurel & Hardy comedy waiting to happen. The boards are 8 feet long and can easily knock over several people at once if one is not paying attention. We exited the store and made a deal to go out into the sea the next day. And that is exactly what we did. As planned we met up at my house, put the boards in the back of my truck and made our way to Malibu. It was a very hot day and the ocean flat and glassy, perfect for beginners getting their arms in shape. Now that is something people don’t tell you about surfing; you need paddle arms. It is the hardest part in the beginning because you have to paddle out, paddle to catch the wave…and paddle back in (while learning) when finished. So going out on a flat day is a nice way to get acquainted with the water, the board, your body and whatever is swimming beneath you. It turned out that we were the only ones in the water because it was a bit cold but crystal clear and somehow welcoming. I must have gone into some kind of meditation mode because although I was petrified, I went in without a thought or hesitation. I paid attention to the current, the waves, the shore, the sandy bottom, the sounds, and my friend. Everything else just fell away and I was a child again. Surfing is intimidating, there is no doubt about it, but surfing or just being in the water flopping around on a board is healing. That is it. So there is really no reason not to try. 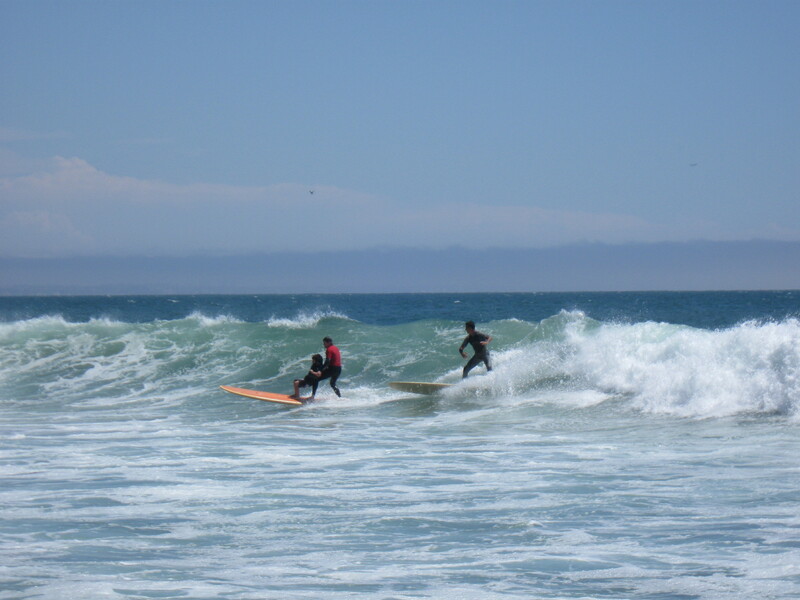 I’ve seen paraplegic Jesse Billauer surf and every summer with Surfers Healing I watch children with Autism tandem surf with men who might throw rocks at a fully functioning newbie on any other day. As I’ve said before, they cleanse their souls every time they walk in the water…only to tarnish them again on land. Tarnish and renew, tarnish and renew. Well that’s how it feels to me anyway. We got out of the water, sat on the beach for a bit, watched a large sea-lion swim up and down the shore barking at his captive audience. The wind blew, the salt caked on our faces and hair. Boards back in the truck, we flew down the coast highway to Tony’s Taverna for a well-earned margarita. It’s not quite summer and I know the weather will turn grey and in the following months the coast will mostly be covered in its marine layer, but we told each other that sun or no sun, we’d go back out. With a high-five and a nod to what cool dorks we were, we sipped our drinks without a care….if only for a moment. OWN that surfboard, Walter. Don’t let ’em intimidate you. One day it’ll be my turn.